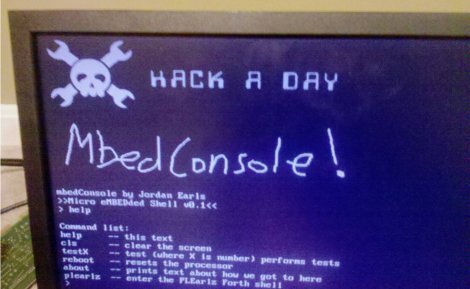 [Jordan] writes in to show us a project he has been working on called MbedConsole. Living up its name [Jordan] has managed to run a 640×480 VGA output, PS/2 port and console all from the mbed itself. We really mean from an mbed only; no extra hardware is required aside from a few resistors and connectors, a VGA monitor and PS/2 keyboard. The code is open source and links are included in the blog. There are even instructions for including your own graphics. There are a few things to tackle still, like SD card support. Currently the PS/2 keyboard lights for caps-lock are not functional. [Jordan] would love to know what else we’d see going on something like this, with 400k of flash and 20k RAM left there certainly is a bit of room for some interesting stuff. One of his main goals is to get rid of the C interface and port an interactive shell over that could do something like BASIC or Forth (to give it that retro environment feel). We have seen the mbed in a handful of projects, what do you think? They really start young these days, this Jordan fellow looks like a little girl. I’d reckon he’s no more than 3 years old! So… a proper competitor the Parallax Propeller, finally? Nice. VGA is easy, pretty much any MCU can generate it; though not all equal resolution and color depth, or with a useful amount of processing power left. Color composite video is actually much harder, and the Propeller seems unique in its ability to generate it easily. [Jordan], if you’ve looked yet and come across any candidates for full-screen editors or BASIC, I’d be interested to hear what you’ve found. A BASIC would be really nice, but Forth would be easier to implement… Really, it should be possible to have both. I have enough Flash for it after all. NuttX could be a good operating system for this kind of a device. It already includes SD-card support, runtime mountable filesystems, command shell and even a graphical subsystem. So the keyboard code is complete and bugfree then. Excellent. Man, the mBed looks really cool until you look at the price! — $60 — seems like you should just be able to buy a palette used terminals for that cost! I’ll just stick to AVR for now. I completely agree the mbed is overpriced. I believe a portion of this is for access to the online compiler. I bought one before this sudden explosion of inexpensive ARM dev boards that could be programmed by USB(ie, without a $50 programmer). I think it was also before the propeller came out, or at least before it became hugely popular. I think the mbed’s main selling point is how everything kind of just works. The online compiler makes everything super consistent and it really is a nice environment to get your feet wet with ARM. It also has a lot of nice peripherals that are a library include away from using.